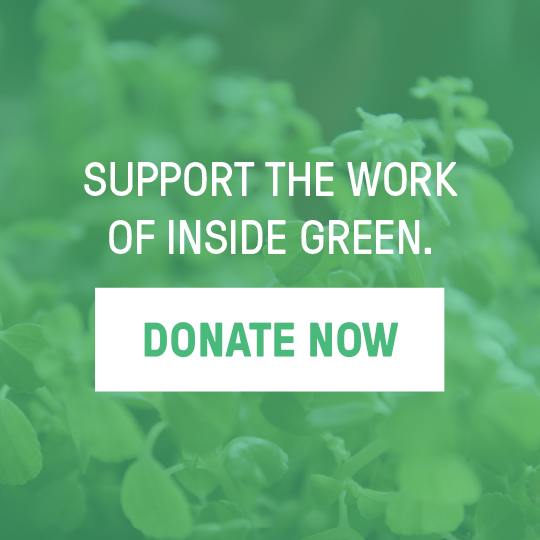 Inside Green is a Vancouver-based project that connects people through the stewardship and gifting of houseplants, thus greening our city from inside spaces out. Participants – or, Stewards, as we call them – can use the Inside Green Plant Picker to identify what they want most in a house plant: air cleaning qualities, a plant that blooms, interesting plant structure, and colourful foliage. In the initial phase, we’ll place over 500 plants with Stewards who will be asked to register their plants onto the site. This is a community effort, so we’ll send participants care-giving tips and ‘how to’ material when it comes time to propagate their plant. We want to help our Stewards create a next generation of plants they can gift to others, thus creating new Stewards who will add their plants to the site, and so on and so forth – contributing to a map that shows the genealogy of plants spreading across the city! Eventually, at the speed of nature, a real life social network of greening will emerge, along with plant genealogies showing how one original cultivar is connected to many plants, all visible on the Inside Green website. And along the way we’ll capture stories, inviting others to register their existing or store bought plants to join the Inside Green movement. We want Vancouver to be a city full of citizens who understand what it takes to nurture a little bit of nature from the intimacy of their own homes, and who care about spreading that skill to their neighbours. We want to build capacity to individually and collectively steward plants and our planet, strengthening our connection to the natural world in all its facets. Using urban homes as its greening platform, this fun, accessible project supports Vancouver’s action plan to be the Greenest City in the world by 2020. Beyond Vancouver, we see the potential for Inside Green to spread worldwide, promoting stewardship of nature, and highlighting Vancouver as a place for progressive, technological, social, and environmental innovation.